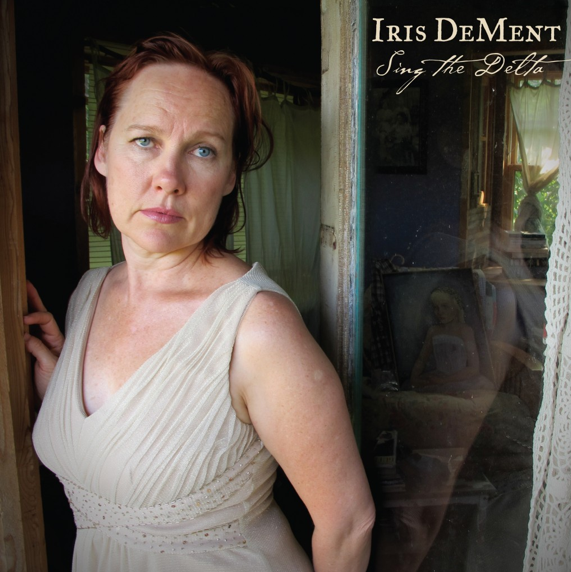 Iris Dement’s singing voice can best be described as the mournful sound of a dove, the backwoods twang of Appalachia, and having what is known in the industry as a “cry” in her voice reminiscent of Patsy Cline. The woman’s got soul – White soul – though she was once classified with a Grammy nomination for the Best Contemporary Folk Album category. It’s been 16 years since DeMent last put out an album, if you don’t include Lifeline, released in 2004 in which she covered well-known gospel tunes with the exception of He Reached Down, an original composition. During a career spanning over a quarter of a century, she has sung with some of the greats like Ralph Stanley, John Prine and Emmy Lou Harris, and made frequent appearances on Garrison Keillor’s radio show, A Prairie Home Companion. A role in the 2000 film Songcatcher, in which she played the character Rose Gentry, featured her singing on the movie’s soundtrack and in 2010 one of her songs was used in the closing credits of the Coen Brothers film, True Grit. Released in October 2012, Sing the Delta is DeMent’s long-awaited, self-composed and much anticipated album. On January 21st she will perform at the Birchmere along with a band consisting of guitar, mandolin, bass, drums and pedal steel guitar. You grew up in a fairly strict Pentecostal household. How much has religion affected your music? I don’t reject religion. I think I’ve just decided to take religion and tune it up to suit myself. I grew up in the church and that environment had a great impact on me musically and every other way, so I couldn’t separate what I do from that world that I was submerged in. It’s all kind of one and the same. I’ve allowed my self to grow with it. I didn’t long ago. I didn’t buy into the stories and all the answers that were written. It was my job to just go along. I took what I learned from church and I kept moving through life with it and adapting it to where I was at any particular time. I’m willing to move as far away from it as I have to. The heart of the thing is still in there intensely for me. Would you say that creating a context for social change within your music is part of your inspiration? I don’t think of things as issues. I’m just talking about what’s going on in my world – what I care about. I am trying to unravel things for myself and put them back together in a way that makes sense, whether that’s music or sitting down having coffee with friends. I think that’s just human nature to try to make sense of your world. And I do that to a great extent through music. I don’t have an agenda. I just want to see what my heart says about the thing. What was it like growing up in such a large family in a house with over a dozen siblings? Was it hard to get heard? It was hard to get heard. But looking back I think there was a huge advantage to that. It meant listening a lot especially when you’re the youngest. I learned to be quiet a lot. I’m really grateful that I was in that position. I think it’s a lot of the reason I did end up writing. Is any one else in your family in music? Oh yes! They all play or sing in the churches. I’m the only one that went out in the world with my music. You have your own label – Flariella. Is it more difficult to get airtime with your own label? For me it’s always been difficult to get airtime. The music business has changed so much that now everybody is on their own label. I enjoy the independence of it. I’m inclined to be by myself. Thankfully there have been enough journalists like yourself that will write about me. What was happening in your life when you wrote “Before the Colors Fade”? I had just lost my mother. She had been gone only a few weeks. When you lose somebody they’re gone, but their presence, and my sense of them, is intensified. No matter how close you are, there’s a fading. Have you played the Birchmere before?